Explorations of poets of the twentieth century, and some of their precursors, in RealAudio and text. Brought to you by Huck Gutman, Professor of English, The University of Vermont. Welcome to the Modern Poetry home page, which serves as an introduction and gateway to some of the richest and most wonderful poetry ever written. You can scroll down and encounter a brief description of each of the poets listed, along with the poet's picture. [If you want to go directly to one of the poets, just click on their name in the list immediately below.] By clicking on any of the pictures of the individual poets, you can go to a page on that particular poet. 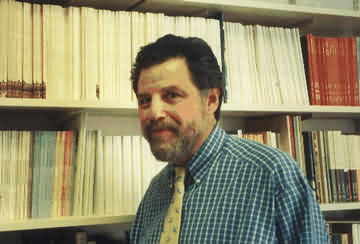 On that page, you will find a RealAudio presentation on the poet by Professor Huck Gutman of the University of Vermont; more biographical and critical information about the poet; and links to other sites. Listed below are the names of major poets of our century, with a few extraordinary precursor poets from the nineteenth century added as well. This list is continually under construction: if you visit in the future, there will be more names, more wonderful poetry to encounter. Anna Akhmatova was one of the great lyric poets of the twentieth century. Born in Russia, she lived through the tumultuous events of that country's history: the fall of the Tsarist government and the Russian Revolution, the internecine struggles of the reolutionary period, the establishment of the Soviet Union, the iron fist of Stalinism, World War II, the Cold War, and the slow thawing of despotic power. Originally a lyric poet of love and her homeland, she was at times brutalized into not writing because of her popularity -- a threat to the regime -- and her independence. During the Stalin years she composed what may be our century's greatest poem, a remarkable lyric sequence called "Requiem." In it, she witnesses to and commemorates the suffering of those who endured the awful terror of imprisonment in the vast prison camp system known as the Gulag: "I stand as witness to the common lot,/ survivor of that time, that place." To explore the poetry of Anna Akhmatova, and encounter one of the supreme accomplishments of twentieth century writing, click on this photograph of the young Akhmatova. Born in Germany, Yehuda Amichai emigrated to Israel when he was twelve. One of the great love poets of modern times, his poems are at once humorous and filled with grief. It is one of Amichai's richest accomplishments that he, by writing in the modern Hebrew spoken on the streets and in the shops and homes of Israel, helped created a vernacular literature for the new nation. Owing in large measure to his example, vernacular Hebrew has become the literary language of Israel, instead of the language of the Bible. In Amichai one almost always encounters a delight in figurative language; yet his poems are never pretentious or tedious, since they speak out of the everyday and towards concerns we encounter every day.To explore the poetry of Yehuda Amichai, click on this photograph of him. Elizabeth Bishop, an American poet, wrote poetry from the 1940's through the 70's. We can seem increasingly, how central her role was: a link between the modernist experimentation of the first half of the twentieth century, and the interest in closely observing the self of more recent times. Though she did not write as many poems as many of her contemporaries, her best and the most influential poems are among the most important work of the second half of the twentieth century. They draw the reader into a world of close observation and wonderfully rich vision. To explore the poetry of Elizabeth Bishop, click on this photograph of her. Charles Baudelaire stunned and shocked France when he published his Les Fleurs du Mal ("Flowers of Evil") in 1855. In many ways, the image we have of the modern artist -- a bohemian, living an economically tenuous existence, exploring what the French call the 'demi-monde' (a world of alcohol, drugs, sexual experimentation), pushing at not only the boundaries of art but the boundaries of public taste, shocking those who encounter his work -- was created from the material of Baudelaire's life. But it is primarily for his poetry, not his life, that he is celebrated: first encounter the modern city in Baudelaire's poetry, and the obsessions of modern life (despair, excess, boredom, the search for meaning) shape his poetic concerns. 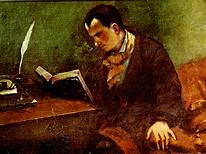 To explore the poetry of Charles Baudelaire, click on this painting of him by Gustave Courbet. The great Greek poet Constantin Cavafy lived,for almost all his life in Alexandria, Egypt. His poetry is the poetry of exile. Some of his poems deal with historical subjects, primarily with those Greeks who, after the fall of Alexander, lived in colonies or countries beyond the boundaries of Greece itself. Other poems deal with a kind of psychological exile: with the fact of being homosexual in a society which categorized gay men as 'deviant.' To Cavafy, however, there is no deviance to homosexuality: only passion, beauty, loss, pain. In exploring sexual themes, he investigates the human condition, and writes poems that are deeply moving and at the same time readily accessible. William Butler Yeats wrote, "We have no enemy but time," and certainly time is one of Cavafy's great concerns. But in his poetry, time is not only loss, it is the medium which allows memory to function, and so is the progenitor of art. One recalls Cavafy, as well, as one of the progenitors of the use of vernacular language in twentieth century poetry. To explore the poetry of Constantin Cavafy, click on this photograph of him. Thomas Stearns Eliot was born in St. Louis and educated in the United States, but once he went to Britain to do graduate work in philosophy he remained in that country for the rest of his adult life. During the first half of the twentieth century he was widely regarded -- both in the English-speaking world, but also beyond -- as the most important and influential poet of the modern era. As time has passed, his stature remains great, but there is recognition that other poets -- among them Rilke, Apollinaire, Williams, Stevens, Lorca, Myakovsky, Neruda -- have been equally influential. His work is notoriously difficult, a situation which he may in part have created to obscure how deeply personal and revealing were the subjects of his poetic work. Despite the fact that his 1922 The Waste Land is generally regarded as the single most important poem of the twentieth century, it is possible that his early work "The Love Song of J. Alfred Prufrock" is his most compelling poem. To explore the poetry of T.S. Eliot and in particular the dramatic lyric "The Love Song of J. Alfred Prufrock" click on this photograph of him. Winner of the Nobel Prize in 1995, Seamus Heaney is an Irish poet of enormous range. His poetry takes up difficult themes: Heaney penetrates to the heart what it is to live in the later twentieth century. But he does so in a voice which is always lyrical and always --surprisingly -- accessible. Having grown up in Northern Ireland, Heaney does not shirk the difficult questions of living in a world which is shaped by both violence and beauty, by the presentness of the past and the possibilities we can shape our own future. His poetry often meditates on the relation between the political and the personal, on the difficult intersection where history and individual consciousness meet. The rare combination of music and historical interrogation work together to make Heaney, in my view, the finest poet writing in English today. To explore the poetry of Seamus Heaney, click on this photograph of him. Zbigniew Herbert was, along with Nobel Prize winners Czeslaw Milosz and Wanda Symborska, one of the leading Polish poets of the second half of the twentieth century. He confronted the violence and anxiety of the modern world with an extraordinary combination of classical reference and ironic gaze: yet his poetry is immensely accessible. In a modern and post-modern world which seems confusing to many, Herbert stands out: his honesty and clarity are perhaps unparalleled among poets. He would be my choice as the most under-appreciated poet of our times. To read Herbert is to encounter a voice that is unforgettable: it is like visiting a whole new continent! To explore the poetry of Zbigniew Herbert, click on this photograph of him. Mayakovsky began writing poetry in one of the most tumultuous eras in modern history, the second decade of the twentieth century in Russia. When the revolutionary upheaval overthrew the Czar and established the U.S.S.R., Mayakovsky was among the strongest supporters of the Bolsheviks. A propagandist and visual artist, he was also one of the most radical and influential of modern poets. A new society seemed to demand a new voice, a new language, a new role for the poet: and Mayakovsky answered this demand. His poetry pushes at the borders of what was possible, and often transgresses those borders. Emotional, theatrical, sometimes rhetorical, Mayakovsky creates lyrics which are as likely to be shaped by wit as by anger, to celebrate life as to argue against its injustices. If there were to be a paradigm, and icon, of revolutionary poetry in the twentieth century, Mayakovsky would be it. To explore the poetry of Vladimir Myakovsky -- revolutionary, humorous, experimental, and often deeply emotional -- click on this photograph of him. Rainier Maria Rilke lived a life totally dedicated to poetry and the world of art. His poems investigate the realm of the esthetic. This subject does not, to some readers (myself among them) by itself seem like the most fertile ground to explore: life, after all, offers us more than poetry. And yet to encounter Rilke is to be captivated: by the clarity and intensity of his willingness to look at the things around him, by his extraordinary commitment to the world in which he lives -- a world made manifest in art, and to which every work of art ultimately returns -- and by the wonderful music of his lines. His astonishing New Poems of 1907-1908 bring a new intensity of focus to poetry; his later poems, among them the sonnet series Sonnets to Orpheus and the monumental series of Duino Elegies, are among the high-water marks of twentieth-century artistic accomplishment. To explore the poetry of Rainier Maria Rilke, click on this photograph of the poet. Wallace Stevens is not, at first glance, the kind of person normally associated with poetry. A corporate executive -- he was chief counsel for one of America's largest insurance companies -- he fashioned a poetry that seems, at first, quite difficult and even obscure. But that is only at first encounter: Stevens writes lyric poems, and his work is far more deeply concerned with his emotions than most critics acknowledge. Poem after poem addresses the joy, or the despair, of everyday life: Stevens continually records 'what he felt at what he saw.' In addition, few poets in the entire history of Western literature have been as consumed by the importance of the imagination, and with the problematic relation between our minds and the world in which we walk and act, which seems so clearly to lie outside our individual selves. To explore the poetry of Wallace Stevens, click on this photograph of him. Poems are essential to human beings. We can't live without them. We need poems, and the fact that so often we are afraid of them, or consider them not worth our time, is something that leaves us impoverished. After all, the poems don't mind: they're just words on a page. The poets who wrote those words, if they are alive, might mind that not many people read their words -- but the poems themselves, the poems don't care. They are just there, for us to read or to ignore. To the extent we don't read poems we are denying ourselves something important. Poems can help us get in touch with our selves. Listening to one's self, paying attention to the contours of our daily existence, is harder to do than it seems, and exploring our capacities for feeling and understanding -- well, there is usually no time for that. After all, there is so much to do, and there are so many places to go, and so many demands on our time. Too often we have only scarce opportunities to explore what is really within us, and to experience what surrounds us every waking moment of our lives. Yet growth, which is so vital to human life: how is it possible to grow if we are not shown new possibilities, possibilities we never even knew were there? How can we try out new ways of seeing and feeling and thinking? Fostering growth: this too is the province of the poem. In one of those fragments of poetry which many people DO know, John Donne wrote that "no man is an island." He meant we all live connected to one another. But, at the same time, we all actually ARE islands, each occupying a consciousness different from everyone else. How often do we really know what someone else is thinking or feeling? And, to turn it around, don't many of us keep most of what we think and feel deep inside us, away from the scrutiny of others? This too is the province of poetry, for of all human activities it is the most deeply dedicated to revealing, to others, what is inside a fellow human being's heart and mind. The poets listed below, every one of them, have something to say to you. In some cases what they have to say will be important, maybe so important that it will alter your life or transform your sense of who you are and what you are capable of. But poems are not infallible: sometimes they can seem silly or trite or just plain wrong. We don't have to bow down in reverence to a poem: if we don't like what the poet is saying or how he or she is saying it, there is no reason to hide our own feelings. If a poem doesn't seem to speak to you or me -- and we have made a serious attempt to listen -- then we are surely justified in deciding you have better things to do than read that poem again. Since poetry is, in my view, primarily an auditory medium -- how the poem looks on a page is not as important as how it sounds when it is read, or how it resounds in your mind as you recall pieces of the poem -- the following pages and programs talk about poems by literally talking about poems. You'll hear poems read, as if the poet were addressing you directly and privately; you'll hear poems talked about because poetry depends on voice, and the human voice is our best means of communicating the deepest truths about our lives.